Researchers from the University of Illinois at Urbana-Champaign have developed a new approach for forming 3D shapes from flat sheets of graphene. This technique may open the door to future integrated systems of graphene-MEMS hybrid devices and flexible electronics. The study demonstrated graphene integration to a variety of different microstructured geometries, including pyramids, pillars, domes, inverted pyramids, and the 3D integration of gold nanoparticles (AuNPs)/graphene hybrid structures. The flexibility and 3D nature of the structures could enable biosensing devices which can be made in various shapes and carry many biological functions. The scientists also expect that the new 3D integration approach will facilitate advanced classes of hybrid devices between microelectromechanical systems (MEMS) and 2D materials for sensing and actuation. The method utilizes wet-transfer and adaptive substrate-engineering, reportedly providing several key advantages over other fabrication/integration methods of 3D graphene. The study demonstrates a simple, versatile, and scalable method to integrate graphene with 3D geometries with various morphologies and dimensions. Not only are these 3D features larger than those reported in previous works, but also more uniform and damage-free around the 3D features. The dimensions of the 3D features vary from 3.5 to 50 μm. 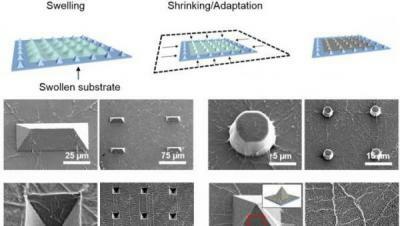 The process incorporates three sequential steps: 1) substrate swelling using a solvent that 2) shrinks during the evaporation process, allowing graphene to 3) adapt, or conform to the shape of a prepared substrate, to achieve damage-free, large area integration of graphene on 3D microstructures.